Addie Wagenknecht examines visibility with tools of culturally defined “feminine” gestures. In her latest series of paintings, a Roomba is reconfigured to spread a lush mixture of cosmetic pigments, pharmaceuticals, perfumes, and skin care across canvas by way of a programmed algorithm. The resulting composition is seductively abstract, usurping the intrinsic role of the materials. Through this act, the artist reclaims visibility with devices typically used to conceal. She sees the end result as a reinterpretation of beauty and a contemporary portrait of a modern woman. 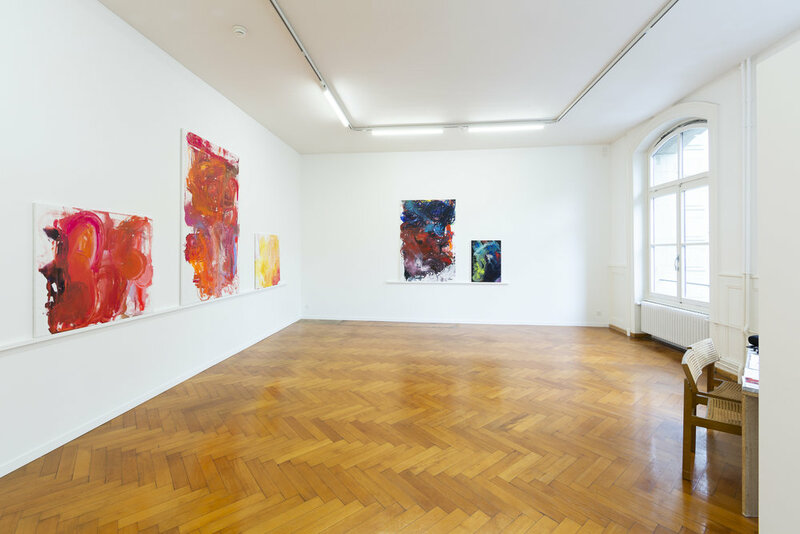 Wagenknecht works with substances that manipulate and alter appearances. Technology, cosmetics, and certain medications are often used to mediate the semblance of perfection. Her works paint a portrait of products marketed toward us as self-amelioration. Perfect Storm (2018) presents an accumulation of these ingredients: cosmetic dyes, sedatives, antidepressants, vodka, and perfume. Xanax and lipstick are distributed by a Roomba in a misguided attempt of cleanliness. When stripped from persuasive packaging, the materials appear as raw color and texture, not seductive tools of transformation. The representation of a female figure is absent in this series, urging Wagenknecht’s question of visibility. In the artist’s solo exhibition in New York City, in early 2018, Alone Together, the female form was illustrated through negative space. Working with a Roomba and International Klein Blue (a paint hue developed by French artist Yves Klein), the artist sat on the canvas while the vacuum attempted to navigate around her body. The resulting composition is shaped by Wagenknecht’s presence. New works continue this non-illustrative dialogue by reclaiming tools used to conform or control as a study of contemporary portraiture. The Roomba’s path, hinted at in some cases by a circular form, generates a homogenized painter’s palette of frenzied, eerily human, effect. Action painting glorified by the Abstract Expressionist movement is reduced to algorithm, executed by a programmed electronic. When Roombas first debuted in the early 00’s, they hinted toward early forms of AI but were still far from the realm of machine learning. Now, new models are striving toward memory capabilities—AI edge detection keeps the devices from falling down stairs, or in the case of the paintings, the canvas. However, AI brings up the same questions of control and visibility Wagenknecht proposes regarding cosmetics. Homogenized production within IT leads to the inability of systems to accurately analyze or view data outside of known demographics. Wagenknecht speaks to this vast othering through gesture, leaning into abstraction as an apparatus of communication. Her artwork implores the viewer to consider selected materials and their implications.